British blues singer/guitar slinger Jack J Hutchinson has teamed up with pals Troy Redfern, Mike Ross, Jack Browning and Darren Lee to form this new good-time rock’n’roll outfit. 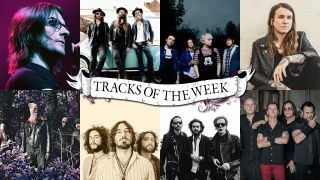 With at least one foot in the Southern worlds of the Black Crowes and Blackberry Smoke (and another in the guitar hook from Get It On by T.Rex), this loose, swaggering single is taken from their upcoming album Mahogany Drift (on sale November 2). We like. One of the softer numbers on this British foursome’s upcoming debut ,You’re Really Something, this is an impressively tight, mature slice of songwriting - part sweetly naive heartache, part warmingly sophisticated West Coast pop rock, all bound together by the cute-but-not-’cutesy’ vocals of Sydney Rae White (also an actress off-of-the-telly, and the big screen). Sometimes the best things really do come in small packages. Stirring, pocket-sized angst is channeled into a blue-collar roots n’ punk framework, with LJG’s love for Tom Petty worn triumphantly on her sleeve. Check out the full album, Bought To Rot, which comes out on November 9. Previously touted as “the missing link between Salvador Dali and The Stooges”, these Belgian oddballs (or ‘Popes of the Belgian Underground’, as they’ve also been called) released a bunch of cool records in the late ‘80s/early ‘90s. Critical acclaim followed. Fame and fortune didn’t. Now, they’re back with this gripping mesh of proto-punk, heavy psych and biker metal, bolstered by a deliciously disturbing video (no surprise that their singer is also an accomplished horror director). Their next album, Paths, is out in February, but for now we recommend you give this first single a spin. For anyone new to Willie’s world, there’s more going on here than the straight-up rootsy image might suggest. This starts out all dirty blues rock strutting before moving into moody outlaw tones and a spacey, world beats-fuelled bridge section. Cool stuff. If nothing here has tickled your fancy, and what you really crave is a bunch of ‘80s San Francisco metallers cackling into your ear holes (in a good way), look no further. Slickly executed, thunderously riffy and beautifully batshit – with nods to Judas Priest and Dio – there’s fire in this old-school place of house of God/Satan/chosen deity yet. Check out more on new album Damned If You Do, which is out in December.